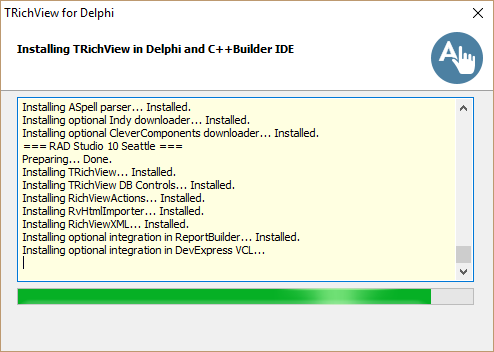 This application can install packages (containing source code or trial units of VCL components) in Delphi and C++Builder IDE. 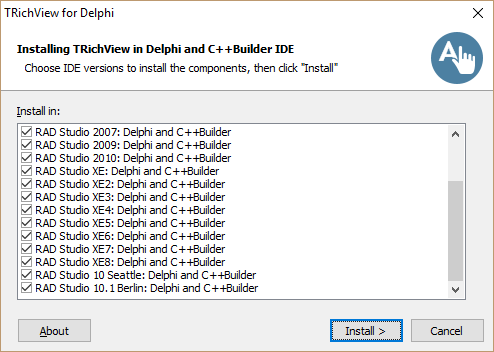 Supported version of Delphi: from 5 to 10.1 Berlin. Supported version of C++Builder: from 6 to 10.1 Berlin. Exception: C++Builder-only packages for BDS 2006 are not supported. We use this installer to install our components (RVMedia, TRichView, ScaleRichView). If you use this installer, we can list your components here. We created an utility generating packages for all supported versions of Delphi and C++Builder, compatible with the installer. We are not ready to share this utility yet, but we can create packages for you on request, if you give us a list of units, required packages and DCR files. IDE Installer and its source code are released under Mozilla Public License Version 1.1. Download the installer and its source code (1.79 MB); updated: June 5, 2017. Install and uninstall instructions, a format of configuration files, package naming conventions and options, a directory structure, etc. can be found in ReadMe.chm, included in the zip-file.